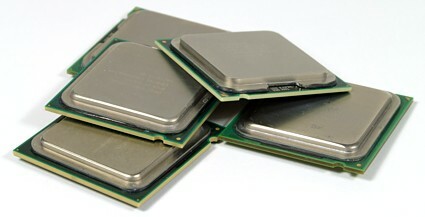 Recent market analysis result showed that Intel shares have risen by 28 percent as compared to last year. Whereas its competitor, AMD is expected to report loss of 85 cents per share, which is equivalent to 570 percent since quarter two of 2006. Apparently, Intel is moving in the right direction and regain major portion of its market share after fierce competition from AMD since last year. Intel has launched its quad-core server processor faster than AMD, which caused AMD to have no choice but to offer its dual-core server processor at very low price just to secure a seat in this competitive PC market. The slashing price war by Intel has again put AMD into more difficult position. Besides, some analysts commented that Intel has broader product ranges that cater for almost every segments in both PC/laptop and server market. Back to AMD, the roadmap is not clear and the long waited Barcelona processor has again put it in uncertainty.Some may hope that with Barcelona introduction in quarter three, AMD may able to regain its loss market share in server segment. However, it may not be significant in total revenue generation in PC market, after considering that the server demand may not be that huge to create the momentum. One thing for sure, the competition will still be on-going and those who benefit from the price slashing war would be the consumers that able to get higher performance per watt and more importantly performance per cost.